Spirits were high as the The Hasbrouck Heights Little League held their 54th Opening Day Ceremony Saturday, April 14, 2007. The event began as the little leaguers and their families marched from the club house along the swim club parking lot, across Oldfield Avenue, down onto the Major League Field and assembled along the perimeter of the infield. 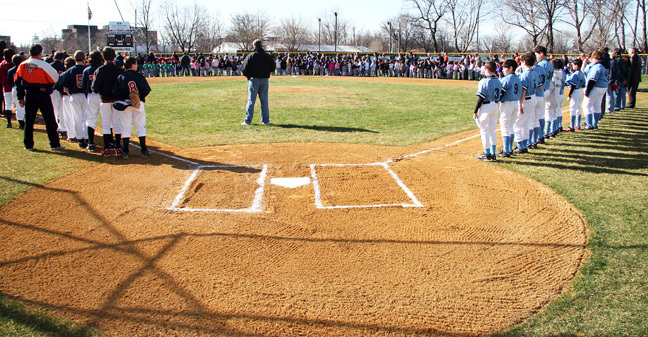 Hasbrouck Heights Little League President Mark Dulhagen officiated. The program began with little leaguers stating the Little League code and reciting the Pledge of Allegiance. Everyone removed their cap and faced the American Flag during the playing of the National Anthem. Mr. Dulhagen made several announcements. To kick off the 2007 season, Gary Doran (who has served as umpire for 20 years and umpired the first game), threw out the 2007 season opener pitch. Van Hook and Lions Club teams then played the first game of the season on the Major League Field.